During public comment, a Los Osos resident asked for more information about a proposal to spend $273,990 for the rehabilitation of five parks, an item on the consent agenda. As a staffer attempted to answer questions about the issue, Andre and the group of SLO County Progressives marched to the front of the room while carrying a naked man on a gurney, to symbolize Andrew Holland, an inmate who died a torturous death in the county jail more than a year ago. 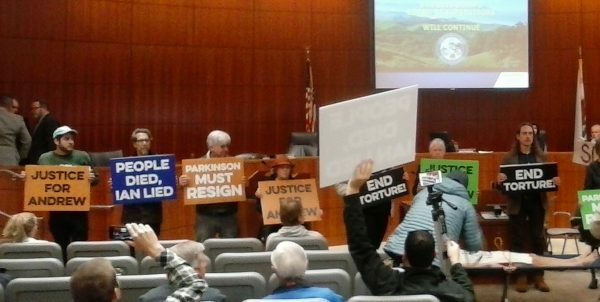 The protesters held up signs asking Parkinson to resign and seeking justice for Holland. Supervisor John Peschong then called for a 10 minute break. Following the break, Peschong attempted to reconvene the meeting. The protesters stood their ground and the board ended the morning session and recessed until 1:30 p.m.
Andre’s responses are to faint to understand. While he serves on the local Democratic Party endorsement committee, Andre is also a paid campaign manager for sheriff candidate Greg Clayton, district attorney candidate Mike Cummins, and District 4 supervisor candidate Jimmy Paulding. More than a year ago, CalCoastNews broke the news to both the public and the Holland family, that Holland had died after being strapped for 46 hours in a restraint chair. CCN reporters also detailed how the sheriff’s department attempted to cover up the details of Holland’s death by dispersing false information. At that time, the SLO County Progressives did not rally against Holland’s treatment at the jail. Several of the group’s leaders forbid members of their private Facebook page from sharing links to CalCoastNews articles, members said. The group has denied multiple Democrats in the community who have been critical of Hill from participating on their private Facebook page. For example, Grover Beach Councilwoman Debbie Peterson, a Democrat, was denied membership and access to the Progressives private Facebook page. Thanks Nick, those who you represent will not be getting my vote. I won’t stand up and make a scene. But I will be talking to all of my local family and friends. And we all vote! Progressive a nice way to say Socialist/Communist. So why were the Sheriffs laughing after torturing and killing someone? Oh I see…because San Luis Obispo is the happiest city in the country! Sicko City. The most corrupt county in the USA (according to the FBI). Ms Peterson, be thankful you’re not allowed to join the FB page of these wackos. If the Holland family supports this type of behavior they have lost my support. I grieve for their loss and want justice but this type of stunt punishes good people. The taxpayers have been punished enough. Yes the taxpayers have, to the tune of $5,000,000, and no one has been held accountable, and Sheriff Parkinson thinks his laughing officers and staff did nothing wrong and just wants to blame everyone else. Want to know what exactly did the Andrew Holland Family do to prevent this sick individual from committing crime, not to seek help, take did med’s, etc. Seems to me that dumping this mental problem on the County, on the jail system was their way of him being taken care of and when that went astray (very sad for Andrew) they cry wolf. There was no place to put this individual because no one wanted him: not the family, mental health, etc. The Sheriff’s Department made every attempt to seek mental help, judges ordered it, but all options refused! The Settlement was paid because the County Mental Health turned Andrew down because they said they were full and that was not true. So, a MEDICAL settlement was made! Strapped in a chair for 46 hours? Defend that!